With the warming spring temperatures, it is time to start caring for your garden again. While tending plants and working on the soil might be at the top of your list, it might be time to update your garden tool kit. If you’ve kept your tools in storage all winter long, you may need to replace or add to your existing collection. Spring garden tips will help you grow healthier plants, but having the right gardening equipment will make the work easier. In this post, we are going to look at the essential gardening tools you will need this spring. Your garden tools list should include a garden trowel and fork, pruning shears and loppers, a garden shovel, wheelbarrow, hoe garden tool and rake, and watering equipment. These essential gardening tools are the ones you are going to need when you get down to prepare the soil and work on your plants. Both of these gardening tools are good for turning the soil and can help to loosen weeds that need to be removed. Your trowel will be good for digging in the soil and for planting new seeds or bulbs. If the soil is tough or dense, you can then turn to your garden fork to break things up. Pruning shears and loppers are the best gardening tools for jobs like cutting and trimming branches and stems. Your pruning shears are your handheld tool for working on the branches of bushes and plants. With loppers, you have a gardening tool that cuts in a way that is similar to pruning shears, but they have longer handles to provide more leverage. This makes them good for trimming thicker branches on bushes and trees. Beyond these tools used for gardening, you may also want to consider an electric hedge trimmer. If you have a lot of bushes or hedges, you can save a lot of time by using a tool like the 4.5 Amp 24” Rotating Head Electric Hedge Trimmer. If you are working on an outdoor garden, you can’t forget to add a shovel to your garden tools list. It is one of the most important tools used for gardening because it can make it easier to dig into soil when digging a hole. Your shovel can also be used to edge around the garden, help you lift sod, and will even make it easier to move things like soil and fertilizer from one place to another. It’s easy to see why this is considered one of the essential gardening tools. 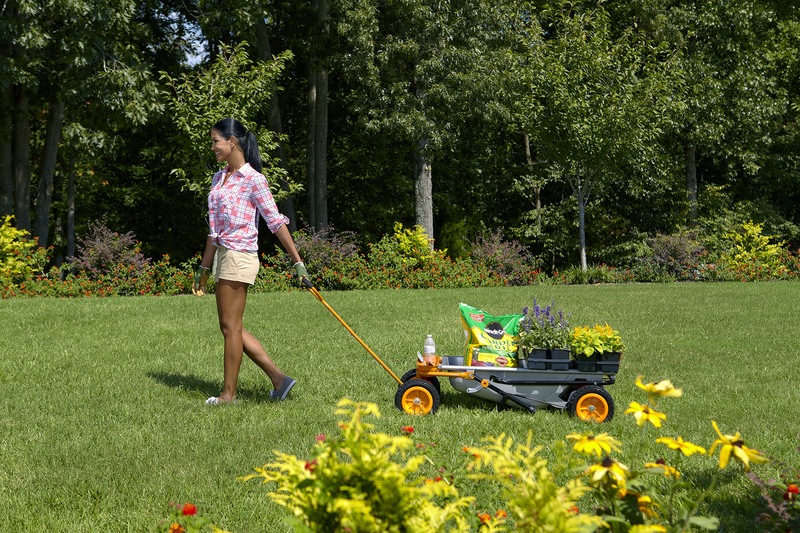 With your garden wheelbarrow, you can move around loads of soil, compost or mulch. You could even load it up with your other gardening tools to make it easier to work your way around the yard as you tend to your garden. This is a great way to make the most out of the spring garden tips you’ve come across. If you are looking for a nice garden wheelbarrow to add to your garden tool kit, you should check out the WORX Aerocart 8-in-1 Wheelbarrow. This durable wheelbarrow is easy to handle and perfectly balanced to take the work out of lifting heavy loads. Along with that, the versatile design means that it can also double as a dolly, yard cart, and more. You could even buy the Aerocart Snow Plow accessory to use this wheelbarrow for clearing driveways and walkways during winter. The hoe garden tool and garden rake are two things you will need to help prepare the ground and garden beds. The rake is great for clearing debris out from the garden, and the garden hoe tool is good for removing weeds and preparing the soil for new plants. If you are working in a vegetable garden, you will want to go with a heavier hoe that has a wider blade. For flower beds, you will need a lighter hoe garden tool with a thinner blade. No garden tool kit is complete without equipment for watering your garden. You will definitely need a good garden hose with a spray nozzle at the end. Along with that, you are also going to want to get at least one watering can. The 20V Hydroshot Portable Power Cleaner is another tool that could be useful for watering your garden. The more powerful settings are obviously great for cleaning outside the house, but this power cleaner also comes with a shorter watering lance that produces a gentle spray for watering trees and plants. It’s clear that there are many essential tools used for gardening, and if you’re serious about creating an impressive spring garden, you may want to add some of these to your garden tools list. They’ll help you cultivate the garden of your dreams without the extra hassle. Find all you need to build the ultimate garden tool kit at WORX! Your garden tools list should include a garden trowel and fork, pruning shears and loppers, a garden shovel, wheelbarrow, hoe garden tool and rake, and watering equipment. 3 Pro Tricks to Keep Your Yard Looking Great All Season WORX Aerocart Review on Better Homes & Gardens online Why Isn’t My Grass Green?